Vice Admiral David L. Brewer III, recipient of the Onyx Magazine state of Florida’s 2010 Lifetime Achievement Award, is co-founder of the David & Mildred Brewer Foundation, which has provided scholarships for empowerment programs for students in the Orlando, FL area. He served over 35 years in the U.S. Navy. During his career, he commanded two ships, winning awards for combat efficiency and community service. Additionally, he was honored with the Naval War College’s Distinguished Graduate Leadership Award – 10th recipient in the history of the War College; the Navy League of the United States Vincent T. Hirsch Maritime Award; the National Defense Transportation Association’s Department of Defense Distinguished Service Award; among others. 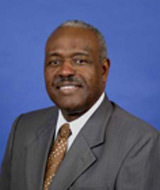 After retirement, he was unanimously selected as the 46th Superintendent of the Los Angeles Unified School District (LAUSD), serving 2006-2008. Under his leadership, the District had its highest academic gains in over five years. He was honored with the Los Angeles NAACP’s Man of Valor Award; Who’s Who in Black Los Angeles; cable television’s Telly Award for best local programming for his TV show Transforming Education with Superintendent Brewer; and Great Beginnings for Black Babies’ Dr. Virginia Hunter Education Award.